Today, is May 31, 2009, which is the Day of Pentecost for 2009. Ronald Weinland is supposed to be in the Netherlands or Belgium today. If by Pentecost I’m just going to make this real clear to everyone. If by Pentecost it is not powerfully and abundantly clear that there has been a great deal of destruction that will clearly encompass a third of all plant life in the US and at least the clear results of this mingled with blood the death of very much animal life and the beginning of large numbers of human life then I will stop preaching. Just so all the critics and everyone out there will understand. I am true to my word in these things. OK? And for all the critics if by the end of July and for most likely around Pentecost if nothing has clearly caused great destruction and death I will make it very clear that I was a false prophet. I will do exactly what I said I would do on all of those interviews that I have held; to do less, aah well, would be quite insane. (Weinland R. Three More Weeks–quote from near the 1 hour 28 minute point from the CGPFK website version. Sermon given March 29, 2008). Pentecost was Sunday almost a calendar year ago (June 8th, 2008 to be exact). Of course, Ronald Weinland failed to keep his word in 2008. God has revealed to His Church the exact timing for the return of Jesus Christ, which is on Pentecost (May 27) of 2012. Although others have stated that an end-time will occur in 2012, they do not understand what this involves, and there are important reasons why they believe as they do, but it is not because God revealed the truth of the matter to them. Of course, Ronald Weinland is wrong about 2012. But I am not: Jesus will not return in 2012 as the Great Tribulation has not started yet. Actually, I have been warning about Ronald Weinland on the internet longer than any other than I am aware of. And so far, I have been proven correct and him proven false every time. Because Ronald Weinland relies on himself, his own imaginations, and his writings, while I instead rely upon the Bible and the understandings we have of it in the Living Church of God. Followers of Ronald Weinland need to realize that he has NOT be true to the word of God, he is not one believers would wish to follow. End of Mayan Calendar 2012–Might 2012 Mean Something?There is a Mayan calendar prediction for change in 2012. 2012 changes were also centuries ago predicted by the Hopi Native Americans. Do Mayan/Hindu/Hopi/Buddhist/New Age/Nostradaumus prophecies have any value here? Why might Satan have inspired this date? Does the Dresden codex show destruction of the earth by flood? Can the great tribulation start before 2012? Concerns About Ronald Weinland’s Church of God-Preparing for the Kingdom of God Ronald Weinland falsely claims to be one of the two witnesses God is raising up and that the end will come in 2008 (first April 17th, then June 2008, now December 14, 2008). Why is he a false prophet? He also has at least one other view that suggests that he is not part of the Church of God. There are Many COGs: Why Support the Living Church of God? This is an article for those who wish to more easily sort out the different COGs. It really should be a MUST READ for current and former WCG members or any interested in supporting the faithful church. It also explains a lot of what the COGs are all about. Jesus taught, “narrow is the gate and difficult is the way which leads to life, and there are few who find it” (Matthew 7:14),. Pentecost pictures that only a few will find the way in this age–but implies that others will later. Tonight beginning after sunset, until tomorrow at sunset is the Holy Day known as Pentecost. 1,978 years ago, the disciples of Jesus were meeting together to observe this day (Acts 2). On that day the Holy Spirit was given and the New Testament Church began. What many have not considered is that if the disciples of Jesus did not think that they should still be observing this so-called Jewish holiday, then they would not have been present together for the Holy Spirit to come. When the Day of Pentecost had fully come, they were all with one accord in one place (Acts 2:1). Notice that the emphasis is on the fact that the Day of Pentecost had fully come. The Bible is making it clear that the events that follow were directly related to the fact that the Day of Pentecost had fully come. And, it happened to the disciples because they were all observing it together. The Living Church of God believes that the New Testament church began on Pentecost in 31 A.D. and that its observance in the Book of Acts shows that the early disciples clearly did believe that they were to continue to observe practices (Sabbaths, Holy Days, etc.) that the Jews did. Pentecost: Is it more than Acts 2? Many “Christians” somewhat observe Pentecost. Do they know what it means? It is also called the Feast of Harvest, the Feast of Weeks, and the day of firstfruits. Pentecost Quiz This is a Pentecost quiz based upon the Old and New Testaments in the Bible. Catholic Wonders: Should You Believe Them? Do those who have claimed to be “Catholic prophets”, but have signs and wonders (like being a stigmatic) prove that the Church of Rome is still faithful? Actually, one book that I own, titled The Thunder of Justice, essentially makes that claim and has many photographs of signs and wonders that the authors seem to believe proves that their version of the Catholic faith is correct. Other Catholic prophetic books seem to make similar claims (I own about 2 dozen of them). But do these signs prove that these people are of God? Might demonic influence be a factor? 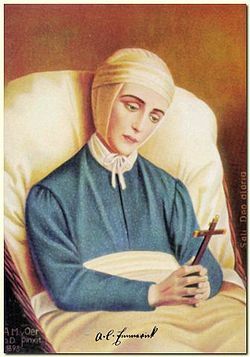 Blessed Anna Maria Taigi (died 1837): Although she was carried away daily by ecstacy…Indeed, Anna herself had known fear, at first, thinking herself a victim of an illusion, from which she strove to free herself (Rigby S. Wife, Mother And Mystic (Blessed Anna-Maria Taigi). Edited by D. Newton. Nihil Obstat: Carolus Davis, S.T.L., Censor deputatis. Imprimatur: E. Morrough Bernard Vic. Gen. Westmonasterii, die Februarii, 1952. Reprint TAN Books, Rockford (IL), 1970, pp. 173,180). Nun Emmerich: 1822…October 4…I fought against a whole legion of devils who excite minds against me and do all they can to harass me…They want to install bad Bishops…(Emmerich AC. The Life of Lord Jesus Christ and Biblical Revelations. Schmöger edition, Vol. IV. Nihil Obstat: D. Jaegher, 14 Februari 1914. Imprimatur: A.C. De Schrevel, Brugis, 14 Februari 1914. Reprint TAN Books, Rockford (IL), 2004,, p. 299). It should be mentioned that on October 3, 2004 Anne Catherine Emmerich was beatified by Pope John Paul II (Wikipedia). Yet, it should be mentioned that she claimed to see Limbo, a place that the current Pope Benedict XVI has indicated does not exist (see What is Limbo? Is there such a place as Limbo?). The first descent of Jesus into Limbo was the fulfillment of early types, and in itself a type whose fulfillment is effected by today’s releasing of the poor souls (Schmöger, p. 355). So, a demon-influenced woman in some type of trance, saw Limbo, which does not exist, yet she was made a saint (many more quotes from Nun Emmerich on Limbo are in the article What is Limbo? Is there such a place as Limbo?). There were other seers who also had problems that should disqualify them as being send as God’s servants. thing, or if thou mayest become stronger. months, that by them they might tell things that shall come to thee. they may be warmed, nor fire, that they may sit thereat. Furthermore, if there were no demonic influences and all these mystics and writers were actually inspired by God, then none of their prophecies would ever fail. Giovanni Melchiorre Bosco also known as “Saint Don Bosco” (1862): Don Bosco said, “There will be chaos in the Church. Tranquility will not return until the Pope succeeds in anchoring the boat of Peter beween the Twin Pillars of Eucharist Devotion and devotion to Our Lady. This will come about one year before the end of the century.” (Prediction made in 1862 for the end of the 20th century (Flynn Ted and Mary. The Thunder of Justice. MaxKol Communications, Inc. Sterling (VA), 1993, p. A213). This prophecy by the Catholic saint Don Bosco did not come to pass when he said it would. Hence, he is a false prophet, yet he is still a Roman Catholic saint. God did not give Don Bosco that vision. What about other stigmatics and/or mystics with various signs and wonders? In 2005, Gerhard Ludwig Müller, Bishop of Regensburg, formally opened the Vatican proceedings for her beatification. (Therese Neumann. Wikipedia, viewed 02/07/09). But it should be clear that God did not speak through her either. The fact that some claim that Rome has had 321 stigmatics (Flynn, p. 20), does not mean that these individuals had a sign from God. There is NOTHING in the Bible that would suggest that God would place the “stigmata” upon His true followers. Perhaps I should add that in the pro-“Catholic” wonders book titled The Thunder of Justice, there are dozens of statements from those who supposedly communicated with “Mary” that claimed that the end would come by the year 2000. They, of course, also are in error. It does not matter how impressive one thinks various wonders are–they simply do NOT prove that the person with/receiving them is truly God’s servant. Actually, there have been so many provably false apparitions/locutions allegedly from Mary, that the Vatican has decided that it needs to stop its followers from proclaiming them publicly until the Vatican approves them (see The Pope and Marian Apparitions)–and the Vatican, to its credit, has not approved any as far as I have been able to tell since it implemented that policy. 9 The coming of the lawless one is according to the working of Satan, with all power, signs, and lying wonders, 10 and with all unrighteous deception among those who perish, because they did not receive the love of the truth, that they might be saved. 11 And for this reason God will send them strong delusion, that they should believe the lie, 12 that they all may be condemned who did not believe the truth but had pleasure in unrighteousness (2 Thessalonians 2:9-12). 21 “And if you say in your heart, ‘How shall we know the word which the LORD has not spoken?’– 22 when a prophet speaks in the name of the LORD, if the thing does not happen or come to pass, that is the thing which the LORD has not spoken; the prophet has spoken it presumptuously; you shall not be afraid of him (Deuteronomy 18:21-22). Thus, it should be clear that God did not speak though people such as Don Bosco, Therese Neumann, and most who have claimed to receive messages from “Mary”. But, you might ask, then what about the prophecies that have or may still come to pass, do they not prove that the prophets/prophetesses came from God? 24 For false christs and false prophets will rise and show great signs and wonders to deceive, if possible, even the elect. 25 See, I have told you beforehand (Matthew 24:24-25). … they are spirits of demons, performing signs…(Revelation 16:14). 1 “If there arises among you a prophet or a dreamer of dreams, and he gives you a sign or a wonder, 2 and the sign or the wonder comes to pass, of which he spoke to you, saying, ‘Let us go after other gods’–which you have not known–‘and let us serve them,’ 3 “you shall not listen to the words of that prophet or that dreamer of dreams, for the LORD your God is testing you to know whether you love the LORD your God with all your heart and with all your soul. 4 You shall walk after the LORD your God and fear Him, and keep His commandments and obey His voice, and you shall serve Him and hold fast to Him (Deuteronomy 13:1-4). It needs to be emphasized that the Church of Rome that claims to be the Catholic Church and sometimes even “the Church of God”, has changed many of the original teachings that the true Church of God had (which the Living Church of God still has, for documented details, please see Which Is Faithful: The Roman Catholic Church or the Living Church of God?). Rome has not been faithful to many of the most basic early church beliefs, practices, and traditions. The current Church of Rome sadly does tell people to worship “other gods” than what the Bible shows. It also has changed the ten commandments (see The Ten Commandments and the Early Church) and even encouraged military participation (in violation of the commandments and the early traditions of the even its church, see Military Service and the Churches of God: Do Real Christians Participate in Carnal Warfare?). Those Roman-connected mystics whose prophecies will be somewhat fulfilled are often the mirror-image, the opposite, of what the Bible says real Christians should heed. But some may say, aren’t these saints, God’s ministers, or holy people? 12…I will also continue to do, that I may cut off the opportunity from those who desire an opportunity to be regarded just as we are in the things of which they boast. 13 For such are false apostles, deceitful workers, transforming themselves into apostles of Christ. 14 And no wonder! For Satan himself transforms himself into an angel of light. 15 Therefore it is no great thing if his ministers also transform themselves into ministers of righteousness, whose end will be according to their works (2 Corinthians 11:12-15). Several private prophecies of canonized Saints specifically state that there will be a latter restoration of the Holy Roman Empire and that there will be at least one last Holy Roman Emperor. The authenticity of the authorship of such prophecies of canonized Saints (e.g., St. Hildegard, St. Vincent Ferrer, St. Francis of Paula, and St. John Vianney) at least over the last eight hundred years is scholastically unquestionable. I would tend to a pick none of the above. I believe that various Catholic “prophets” have sometimes been deluded by demons (as well as their own imaginations, cf. Romans 1:21, KJV) and that this is part of a Satanic conspiracy with frequent “Catholic” complicity that has spanned more than seventeen centuries. I would like to also emphasize that fact that not all the “prophecies” are exactly the same way, which is consistent with demonic influence–as some “private prophecies” are in blatant contradiction to others. Furthermore, related to the final “Holy Roman Emperor”, there are many Catholic and biblical prophecies that warn that the one who will raise up an ecumenical changed church (apparently calling itself “Catholic”) and that this is NOT a good thing. While other “Catholic” writers (like Desmond Birch) have advocated the rise of one that sounds the same as the Beast of Revelation 13. 9 For to this end I also wrote, that I might put you to the test, whether you are obedient in all things. 10 Now whom you forgive anything, I also forgive. For if indeed I have forgiven anything, I have forgiven that one for your sakes in the presence of Christ, 11 lest Satan should take advantage of us; for we are not ignorant of his devices (2 Corinthians 2:9-11). I strongly believe that part of the reason that Jesus showed John what was in the Book of Revelation was because it was clear what Satan was going to try to do to annihilate the true Church. Of course, God also knew that Satan’s first attempt would be to kill Jesus as an infant (hence the prophecies about that in Jeremiah 31:15; Matthew 2:17-18) and that that attempt would fail. Probably immediately after Revelation was penned, Satan realized that he somehow needed to get major portions of humanity to reject Revelation as written–and his plan to do that has succeeded to a major degree. 7 For the mystery of lawlessness is already at work; only He who now restrains will do so until He is taken out of the way. 8 And then the lawless one will be revealed, whom the Lord will consume with the breath of His mouth and destroy with the brightness of His coming. 9 The coming of the lawless one is according to the working of Satan, with all power, signs, and lying wonders, 10 and with all unrighteous deception among those who perish, because they did not receive the love of the truth, that they might be saved. 11 And for this reason God will send them strong delusion, that they should believe the lie, 12 that they all may be condemned who did not believe the truth but had pleasure in unrighteousness (2 Thessalonians 2:7-12). Since the Bible warns about this in advance, you do not have to be deceived. Now is the time to change and embrace the Christianity of the Bible. The Christianity that was first faithfully practiced in Jerusalem, Rome, and Asia Minor, until people compromised and changed it (see Location of the Early Church: Another Look at Ephesus, Smyrna, and Rome). The truth is that I believe that demons have spoken to and responded to various priests/nuns/mystics, but I do believe that the purpose is to confuse people so that they will NOT believe what is in the Bible–especially to how it relates to end-time prophecy. And while not all of the visions are in error, no one should trust them beyond the Bible. What Can We Learn from Private “Catholic” Prophecies? There have been those claiming Catholicism over the centuries that have accurately predicted many events, as well as have made many errors. What might Catholic prophecies reveal about the future? Will an antipope help take over the world? Mary, the Mother of Jesus and the Apparitions Do you know much about Mary? Are the apparitions real? What might they mean? Are Protestants moving towards Mary? How might Mary view them? Do Certain Catholic Prophecies About Antichrist Warn Against Jesus? Will the final “Anti-Christ” be Jewish, insist on Saturday, be opposed to the trinity, and bring in the millennium? Catholic writings indicate this, but what does the Bible show? End of Mayan Calendar 2012–Might 2012 Mean Something? There is a Mayan calendar prediction for change in 2012. 2012 changes were also centuries ago predicted by the Hopi Native Americans. Do Mayan/Hindu/Hopi/Buddhist/New Age/Catholic/Nostradaumus prophecies have any value here? Why might Satan have inspired this date? Does the Dresden codex show destruction of the earth by flood? Can the great tribulation start before 2012? Which Is Faithful: The Roman Catholic Church or the Living Church of God? Do you know that both groups shared a lot of the earliest teachings? Do you know which church changed? Do you know which group is most faithful to the teachings of the apostolic church? Which group best represents true Christianity? This documented article answers those questions. Português: Qual é fiel: A igreja católica romana ou a igreja viva do deus? Tambien Español: Cuál es fiel: ¿La iglesia católica romana o La Iglesia del Dios Viviente? Auch: Deutsch: Welches zuverlässig ist: Die Römisch-katholische Kirche oder die lebende Kirche von Gott? Posted in Prophecy, Religious News | Comments Off on Catholic Wonders: Should You Believe Them? Much of what we learn about the origins of the people of Europe is skewed toward a Greco-Roman bias. What does that mean? Who, then, can tell us who the Scots were? Well, how about the Scots themselves? It is widely understood that the ancient Israelites crossed the Red Sea in the fifteenth century bc—which would date the Scots’ migration from Greater Scythia to the third century bc! This equates well with other information that we can find, showing that there were successive migrations of people from the region of Scythia, which today comprises southern Ukraine. Who were the Scythians? According to the Encyclopaedia Britannica, “Most writers think the Scythians who troubled Asia were Sacae from the east of the Caspian” (11th edition, article: “Scythia”). This is the region where, in the eighth century bc, the Assyrians had settled the ten tribes of Israel whom they had taken captive (see 2 Kings 17:23). The Israelites were named after their father Jacob, whose name God had changed to Israel. Israel’s father was Isaac—from which the name Sacae is derived. That name in turn became “Saxon” (son of Isaac). These “Saxon” people have left their name in northern Germany (Saxony) and amongst the people of southeast England: Sussex, Essex and Middlesex. The name Scot is also derived from “Scyth.” The Scyth traveled to Scotland via Spain and Ireland. Prior to the Dalriadic migration of the Scots from Ireland to Scotland, the northern area of Ireland was known as “Scotia” (note the similarity to “Scythia”). These people simply carried their name with them into the highlands of Scotland. What else has been carried through these nations? If you are familiar with the bagpipe, a characteristically Scottish musical instrument, you may be surprised to learn that bagpipes are found in every country mentioned in the Declaration of Arbroath and in BBC correspondent Whewell’s report. Bagpipes are played in a total of 25 nations in the Middle East, Europe and North Africa. Notice this definition, from The New Bible Dictionary, of the word dulcimer used in Daniel 3:5, “It is now generally supposed to have been a form of bagpipe.” This most famous of Scottish instruments has left a musical footprint wherever the Scots have traveled on their journey, from Israel to Assyria and on through the Caucasus Mountains and the Black Sea, to Spain, and finally to their present home by way of Ireland. God speaks to us through the prophet Jeremiah: “Thus says the Lord, who gives the sun for a light by day, the ordinances of the moon and the stars for a light by night… If those ordinances depart from before Me, says the Lord, then the seed of Israel shall also cease from being a nation before Me for ever” (Jeremiah 31:35, 36). Yes, the descendants of Israel (not just the Jews who descend from Judah and part of Benjamin) can be identified! It sometimes amazes me that people rarely consider the fact that all who are now alive descended from peoples thousands of years ago. And many who descended from Abraham, Isaac, and Jacob are found throughout the world. All peoples are also descended from some of the people mentioned in the Bible. Japan, Its Biblical Past and Future, Part 1: Any Witness? This is a draft of an in-process article about Japan. Have they had any witness? Modern Nations and God’s Ancient Plan Many peoples are mentioned in the Bible. And other than the fact that the modern nation of Israel represents the ancient kingdom of Judah, do you know who any of these people are now? Posted in COG News | Comments Off on Who are the Scots? Question:I was recently told that it is wrong to use words like “gosh” or “gee.” Are these words really all that bad? We often hear words like “gosh,” “gee,” and similar words in conversation today. Although they may sound innocent enough, we should avoid using them. Why? Because these words are euphemisms for the names of God and Jesus Christ. A euphemism is “the substitution of a mild, indirect, or vague expression for one thought to be offensively blunt or harsh” (Random House Dictionary of the English Language). We are told in Exodus 20:7, “You shall not take the name of the Lord your God in vain, for the Lord will not hold him guiltless who takes His name in vain.” In other words, we should not use God’s name in any disrespectful or irreverent way. This includes using God’s name in the form of a euphemism. The scriptures illustrate that God places great importance on His name. In Isaiah 9:6, He is called “Wonderful, Counselor, Mighty God, Everlasting Father, Prince of Peace”—all terms of honor and reverence. The Psalms are full of praise for God’s name. “Sing to God, sing praises to His name; Extol Him who rides on the clouds, by His name YAH, and rejoice before Him.” (Psalm 68:4). “Let them praise the name of the Lord, for His name alone is exalted; his glory is above the earth and heaven” (Psalm 148:13). “Make a joyful shout to God, all the earth! Sing out the honor of His name; make His praise glorious” (Psalm 66:1–2). If we casually use God’s name, or a euphemism for God’s name, to express shock, surprise, or even profanity, we are actually showing contempt for the Creator of the Universe. In contrast, through the prophet Malachi, God said, “But to you who fear My name, the Sun of Righteousness shall arise with healing in His wings” (Malachi 4:2). In what ways should we use God’s name? In the New Testament, Christ instructed His disciples to pray to God the Father through His name. “And whatever you ask in my name, that I will do, that the Father may be glorified in the Son” (John 14:13). And when we pray, we should give honor to God’s name. “In this manner, therefore, pray: our Father in heaven, hallowed be Your name” (Matthew 6:9). The disciples healed the sick through the name of Jesus Christ. “Then Peter said, ‘Silver and gold I do not have, but what I do have I give you: In the name of Jesus Christ of Nazareth, rise up and walk’” (Acts 3:6). James instructed the church to continue to follow that example. He said, “Is anyone among you sick? Let him call for the elders of the church, and let them pray over him, anointing him with oil in the name of the Lord” (James 5:14). In the book of Acts, we read that the disciples preached the Gospel through the name of Jesus Christ (Acts 9:15), and baptized in Christ’s name (Acts 8:16, 19:5). Paul told the church at Ephesus, “Let no corrupt word proceed out of your mouth, but what is good for necessary edification, that it may impart grace to the hearers” (Ephesians 4:29). The words we use are important to God. We should ensure that our speaking reflects our honor and reverence for Him. Most who profess Christ try to avoid breaking the third commandment (considered the second in Roman and Lutheran circles). LCG has, once again, simply provided a greater understanding for those who may not have thought too much about this issue. Were the Ten Commandments in Effect Before Mount Sinai? Some have said not. This article provides biblical quotes to answer this important question. Job and the Ten Commandments Was Job written prior to Mount Sinai? Did Job know about the ten commandments? This article provides biblical answers to those questions. Were the Ten Commandments Nailed to the Cross? Some have said so. This article provides some biblical quotes to answer this important question. What Did Paul Actually Teach About the Ten Commandments? Many say Paul taught against the ten commandments. Is this true? This article quotes Paul with his words in green. Are the Ten Commandment Still in Effect? This article quotes the ten commandments and combines some of the previous articles into one article about the ten commandments. The commandments are shown at Mount Sinai, before Mount Sinai, in the teachings of Jesus, after the crucifixion, and in the teachings of Paul. It addresses the most common “traditions of men” regarding them as well. Were the Pharisees Condemned for Keeping the Law or Reasoning Around it? Many believe that the Pharisees were condemned for keeping the law, but what does your Bible say? If they were not condemned for that, what were they condemned for? Brethren, many of you may have seen the recent predictions by Gerald Celente, Chief Executive Officer of the Trends Research Institute—a man renowned for his accuracy in predicting future world and economic events, including the 1987 stock market crash and the fall of the Soviet Union. Considering Celente’s past record of accuracy, his most recent forecasts may send a chill down your spine. Speaking to Fox News late last year, Celente warned that by 2012 America will become an undeveloped nation, that there will be a revolution marked by food riots, squatter rebellions, tax revolts and job marches, and that holidays will be more about obtaining food, not gifts. “We’re going to see the end of the retail Christmas…. we’re going to see a fundamental shift take place…. putting food on the table is going to be more important than putting gifts under the Christmas tree,’ said Celente, adding that the situation would be ‘worse than the great depression’” (“Revolution, food riots in America by 2012,” Commodity Online, December 1, 2008). We are not setting dates, nor are we saying Celente’s forecasts are definitely correct. But this man’s predictions may well come to pass, in time! As Christians, we must examine our own hearts and be sure we are prepared to remain faithful even in a time of food riots, race riots, various rebellions and tax revolts and a period of unusual lawlessness which may come upon us before the final end of our nation. May God help each of us to love one another, forgive one another—and even forgive those who try to do us physical harm.We know all of the scriptures about this, but—during the next several years—we may have an opportunity to put these teachings into practice in a way we have never done before! (Meredith RC. Are YOU Prepared for the “Fiery” Trials? Living Church News, May-June 2009, pp. 1,2,21). There are also others that warn that food shortages can hit America and other parts of the world in the next few years. And as Jesus and the Daniel warned their will be persecutions that will affect the most faithful just prior to the time of the Great Tribulation. Persecutions by Church and State This article documents some that have occurred against those associated with the COGs and some prophesied to occur. Will those with the cross be the persecutors or the persecuted–this article has the shocking answer. Prophecies of Barack Obama? Are there biblical and non-biblical prophecies about Barack Obama. Did Nostradamus predict Barack Obama dealing with the Antichrist? This is the longest and most detailed of the articles here related to prophecy and Barack Obama. Can the Great Tribulation Begin in 2009, 2010, or 2011? Can the Great Tribulation begin today? What happens before the Great Tribulation? When is the earliest that the Great Tribulation can begin? What is the Day of the Lord? James and Ellen White established the Seventh-day Adventist church. What many modern SDAs do not seem to realize is that they were not trinitarian then. The SDAs held what is sometimes called a binitarian or Semi-Arian view of the Godhead. As the SDAs were in some type of confederation with the old Church of God, it makes sense that both groups held similar ideas on the Godhead. The Spirit is freely given us of God if we will appreciate and accept it. And what is it? The representative of Jesus Christ. It is to be our constant helper. It is through the Spirit that Christ fulfills the promise, “I will never leave thee nor forsake thee.” “Verily, verily, I say unto you, He that believeth on me hath everlasting life”. (The bell is sounding for morning worship, I must stop here) (1888 Materials, pp. 1538, 1539, Letter to S. N. Haskell, May 30, 1896). The church members need to know from experience what the Holy Spirit will do for them. It will bless the receiver, and make him a blessing. It is sad that every soul is not praying for the vital breath of the Spirit, for we are ready to die if it breath not on us. We are to pray for the impartation of the Spirit as the remedy for sin-sick souls. The church needs to be converted, and why should we not prostrate ourselves at the throne of grace, as representatives of the church, and from a broken heart and contrite spirit make earnest supplication that the Holy Spirit shall be poured out upon us from on high? Let us pray that when it shall be graciously bestowed, our cold hearts may be revived, and we may have discernment to understand that it is from God, and receive it with joy. Some have treated the Spirit as an unwelcome guest, refusing to receive the rich gift, refusing to acknowledge it, turning from it, and condemning it as fanaticism. When the Holy Spirit works the human agent, it does not ask us in what way it shall operate. Often it moves in unexpected ways. Christ did not come as the Jews expected. He did not come in a manner to glorify them as a nation. His forerunner came to prepare the way for him by calling upon the people to repent of their sins and be converted, and be baptized. Christ’s message was, “The kingdom of heaven is at hand; repent ye and believe the gospel.” The Jews refused to receive Christ, because he did not come in accordance with their expectations (Ibid., p. 1540). And Jesus said He would give us the Comforter. What is the Comforter? It is the Holy Spirit of God. What is the Holy Spirit? It is the representative of Jesus Christ, it is our Advocate that stands by our side and places our petitions before the Father all fragrant with His merits (Reflecting Christ, p. 285). The Lord would have every one of His children rich in faith, and this faith is the fruit of the working of the Holy Spirit upon the mind. It dwells with each soul who will receive it, speaking to the impenitent in words of warning, and pointing them to Jesus, the Lamb of God, that taketh away the sin of the world. It causes light to shine into the minds of those who are seeking to co-operate with God, giving them efficiency and wisdom to do His work (Signs of the Times, September 27, 1899). Like, Herbert W. Armstrong, Mrs. White realized that the Holy Spirit was not a person. They both referred to the Holy Spirit as “it”. The Lord would have every one of His children rich in faith, and this faith is the fruit of the working of the Holy Spirit upon the mind. He dwells with each soul who will receive Him, speaking to the impenitent in words of warning, and pointing them to Jesus, the Lamb of God, that taketh away the sin of the world. He causes light to shine into the minds of those who are seeking to cooperate with God, giving them efficiency and wisdom to do His work (Ye Shall Receive Power, p. 59, 1995). Hence, those who believe that they are relying on her original writings need to be very careful. The Father is the greatest…The Son is next in authority…The inexplicable Trinity that makes the godhead three in one and one in three, is bad enough…(Quoted in Wiebe E. Who Is the Adventist Jesus? Published by Xulon Press, 2005, p. 167). Most early Adventist pioneers were anti-Trinitarians… In 1931 the Adventist Yearbook contained a statement of twenty-two fundamental beliefs, one of which was the Trinity (Pfandl G. The Doctrine of the Trinity Among Seventh-day Adventists. Journal of the Adventist Theological Society, 17/1 (Spring 2006): 160–179). Thus, those who are SDAs might wish to ask since their church changed so much in its view of the Godhead, if it truly was part of the original church, or if it is (as I have long contended) a breakaway group that lost many of its original faithful teachings. SDA/LCG Differences: Two Horned Beast of Revelation and 666 The Living Church of God is NOT part of the Seventh-day Adventists. This article explains a few prophetic differences, the trinity, differences in approaching doctrine, including Ellen White. In November 2008, after reading one reason that a Catholic Cardinal gave claiming that Barack Obama was apocalyptic, I came up with 8 reasons that I thought that he would be. Most had to do with his timing and the policies that he espoused during his campaign to become USA president. Well, thus far, he has fulfilled those 8 reasons. The timing of his election. It may be that there are only two presidential terms left before the Great Tribulation (Does God Have a 6,000 Year Plan? What Year Does the 6,000 Years End?) and the fulfillment of related prophecies in the Book of Revelation (called the Apocalypse by most Catholics). Barack Obama’s very presence (as well as his planned and unplanned actions) should be enough to enable the fulfillment of various end-time prophecies. As one with a Luo Kenyan father, Barack Obama (see also Kenya Rejoices as Obama Wins) may be part of the fulfillment of Deuteronomy 28:43. Since the Roe vs. Wade pro-abortion decision, the USA has became the greatest debtor nation in the history of humankind. Since the USA owes alien nations trillions of dollars, it appears that the curse in Deuteronomy 28:44 of having to borrow from aliens is happening to it now. President Barack Obama has put forth economic policies that will increase that debt (see President Obama Forgot the Bible). Yet, the Bible specifically warns that increasing national debt like this will lead to destruction at the appointed time of the end in Habakkuk 2:3,6-8 (see also Anglo – America in Prophecy). One of the first actual changes that Barack Obama implemented was reversing one or more executive orders that will likely lead to more abortions (see Obama’s Abortion Changes). Yet, abortion is wrong (see Abortion, the Bible, and a Woman’s Right to Choose) and a terrible national sin. And on March 9, 2009 lifted a ban on embryonic stem cell research (see LCG on Stem Cells) another morally wrong sin. To a great degree, women put him in power (see Women Chose Barack Obama). The Bible specifically warns about women ruling over a nation (Isaiah 3:12). The highest cabinet post in Barack Obama’s administration went to Hillary Clinton. Two of his top economic advisors are also women (see Obama Picks Two More Women). Barack Obama will also often need to heed the advice of Nancy Pelosi, Speaker of the US House of Representatives (who has been criticized for her pro-abortion stance, see Vatican Official Says No to Biden and Pelosi, But Not to Palin). The only person in the Bible named “Barak” relied to heavily upon women (cf. Judges 4:4-9). In a policy shift from past administrations, Barack Obama has pledged increased cooperation with the Europeans, including strengthening their defense (see Obama Proving Apocalyptic). This cooperation is likely to lead to the rise of the prophesied King of the North, who is to be the final leader of the Beast of Revelation. Barack Obama has called for increased dialogue with those considered as enemies of the USA. Even some Shiite Muslims believe that his presidency may lead to the rise of their Mahdi (see Barack Obama in Islamic Prophecy? ), who seems to be the same person that the Bible calls the King of the South. An increase of military action in Afghanistan, which candidate Barack Obama continually called for, may stretch USA military commitments. Because of domestic economic concerns and international pressures, Barack Obama is likely to shift priorities away from defense spending and encourage the Europeans to increase their military might. This will help lead to the destruction of the United States, when the Europeans are ready and the USA is not. The truth is that Barack Obama seems well meaning and he is trying to encourage the Americans to back him as he works on his economic agenda. Americans are so concerned about the economy that most do not care that the policies that Barack Obama implemented within his first week of office will result in more abortions and other sins in this nation. 1 Therefore I exhort first of all that supplications, prayers, intercessions, and giving of thanks be made for all men, 2 for kings and all who are in authority, that we may lead a quiet and peaceable life in all godliness and reverence. 3 For this is good and acceptable in the sight of God our Savior, 4 who desires all men to be saved and to come to the knowledge of the truth (1 Timothy 2:1-4). Without national repentance, the United States is doomed for destruction. The focus needs to be on turning to the God of the Bible and not simply on the hope that President Obama will somehow stave off economic disaster for 4-8 years while ignoring the nation’s sins. But irrespective of what he does or does not do, because of the timing of his presidency, it appears that (probably inadvertently) Barack Obama will help set the stage for the ecumenical King of the North, the Muslim King of the South, and even (though more indirectly) the final ecumenical one known as Antichrist. Now, while I do not believe that Barack Obama is the Antichrist, his timing and policies seem certain to help enable the rise of the Beast and the False Prophet (as well as an Islamic King of the South). Time is now relatively short. Prophecies of Barack Obama? Eight reasons why Barack Obama is apocalyptic and eight reasons why Barack Obama is not the Antichrist. Here are there biblical and non-biblical prophecies, from around the world, that seem to discuss Barack Obama. Did Nostradamus predict Barack Obama dealing with the Antichrist? Might Barack Obama set the stage for the kings of the North and South as at least one Shiite prophecy suggests? This is the longest and most complete article on this page on Barack Obama prophecies. Barack Obama Carries Hindu Monkey God Although there are some strange and false stories about Barack Obama, this one seems to be true. One or two ancient Chinese prophecies seem to suggest that the Chinese should exercise caution with the rising European power. Beautiful people come from the West. Korea, China and Japan are gradually at peace (Pui-Hua R. Ancient Chinese Prophecies Till the End of the World. AuthorHouse, Bloomington (IN), 2008, p. 85). At the time this was originally written, there was no USA/Canada as we now know them, hence this part about people from the West is apparently directed towards the Europeans (Europe is west of China). The beautiful people specifically may be the Beast and his false prophet (and/or their representatives) which apparently will impress peoples in places including China. All negative forces are subservient…China now has a saint. Even if he is not that great a hero (ibid, p. 89). One who is a “saint” and “not that great a hero” would seem to be one who is untrustworthy. If this prediction is to be fulfilled, then the “saint” will likely be “the false prophet”. Venerable Magdalene Porzat (died 1850) (Great Monarch)…shall…restore to their dominions the legitimate kings. A just and pious man born in Galacia shall be the Supreme Pontiff: then the whole world will be united and prosperous. One faith only and one emperor shall reign over the whole earth (Connor, p. 38). Therefore many Catholic prophecies suggest that the Chinese will at least temporarily accept some form of a religion that will call itself Catholic. Perhaps I should mention that even many Catholic writers have warned that one that they call an “antipope” will lead a changed church calling itself “Catholic” that will be an ecumenical world religion that many all over the world will follow, but should not follow (see also Catholic Prophecies: Do They Mirror, Highlight, or Contradict Biblical Prophecies?). 8 The beast that you saw was, and is not, and will ascend out of the bottomless pit and go to perdition. And those who dwell on the earth will marvel, whose names are not written in the Book of Life from the foundation of the world, when they see the beast that was, and is not, and yet is (Revelation 17:8). But this acceptance of the “Catholic” leaders by those of China (and other parts of Asia) will not last. The Bible shows (cf. Daniel 11:44) that the Chinese will ultimately wise up and apparently turn on the European leadership. Since the Bible shows that this Beast power will be destroyed (Revelation 19:20) and those that trade with her will mourn (Revelation 18:10-19), the Chinese (and others) need to exercise caution with the rising power in the EU. There is no better time to start being cautious than now. Who is the King of the North? Is there one? Do biblical and Roman Catholic prophecies point to the same leader? Should he be followed? Who will be the King of the North discussed in Daniel 11? Is a nuclear attack prophesied to happen to the English-speaking peoples of the United States, Great Britain, Canada, Australia, and New Zealand? When do the 1335 days, 1290 days, and 1260 days (the time, times, and half a time) of Daniel 12 begin? When does the Bible show that economic collapse will affect the Europeans and the Anglo-nations? Why Prophecy? Because the World Will Not End Next Week Some question or downplay the role of prophecy. This article gives some of the biblical reasons what it is important and explains why the world cannot end for at least 3 1/2 years from now. Some Doctrines of Antichrist Are there any doctrines taught outside the Churches of God which can be considered as doctrines of antichrist? This article suggests at least three. It also provides information on 666 and the identity of “the false prophet”. Plus it shows that several Catholic writers seem to warn about an ecumenical antipope that will support heresy. This world’s playoff is in its last quarter, and things don’t look good: oil crisis, economic collapse, moral and political unrest. But we don’t despair. We have perspective; we’ve read the last chapter and know Who wins! Paul’s letter to the Philippians was written during a personal downturn. The apostle was under house arrest and faced execution at any moment. But his perspective on all this inspired no less than sixteen admonitions to joy and rejoicing in his brief epistle. In 4:6-13 he provides helpful principles for surviving downturns. Second, when the chips are down, think on things upward. “Finally, brethren, whatever things are true, whatever things are noble . . . whatever things are of good report . . . meditate on these things” (v. 8). Third, learn to be content: “I have learned in whatever state I am, to be content: I know how to be abased, and I know how to abound. Everywhere and in all things I have learned both to be full and to be hungry, both to abound and to suffer need” (vv. 11, 12). Contentment brings us back to what really matters and reminds us of how rich we are. The poor among us in the United States have more than the average person in many countries. Paul’s admonition suggests that contentment can be learned. Surviving difficult economic times depends less on how much we earn and more on what we learn: Being better off isn’t always better; sometimes less is more; downturns are inevitable because our economic system is fragile, run by faulty and greedy people. Fourth, downturns are opportunities to grow our faith. Experience confirms that faith is increased not by abundance but by famine. And while Whaid Rose and I have differing views on many subjects, I would tend to agree with the above assessment, but add one critical feature that he did not emphasize (though he hinted about it). And that is, this particular downturn may be part of a sequence of events that will lead to the Great Tribulation, the Day of the Lord, and finally the return of Jesus Christ and the establishment of His kingdom. I would also add that some physical preparations may also be wise (though without the spiritual ones, they will be of little value). Shroud of Turin: Does a 3-D model help prove or disprove its authenticity? You are currently browsing the Church of God News weblog archives for May, 2009.